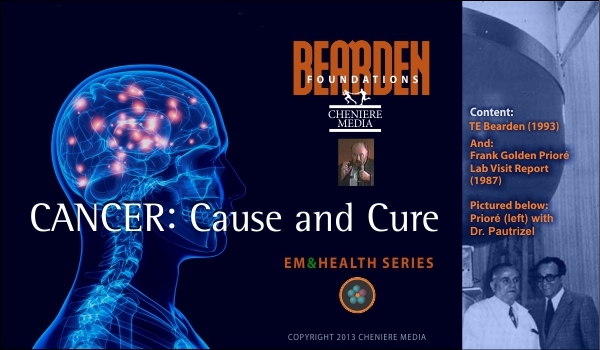 We are pleased to announce the re-release of Tom Bearden's classic lecture “Cancer: Cause and Cure” delivered at the 1990 Brain/Mind convention in Los Angeles, California. The material has been extensively edited to insert legible slides, and the whole presentation has been digitized. Tom points out that at the time of this lecture, a culmination of ten years' worth of his work is represented, and he starts by correcting the errors, omissions, and crippled subsets in contemporary physics and electrical engineering. Using these limited assumptions, meaningful analysis of the potential for developing electromagnetic healing for many of today's life-threatening diseases is essentially precluded, as is also any robust investigation of extracting free energy from the vacuum all around us. A review and full analysis of several modalities of scalar electromagnetic healing is unlocked by correcting these foundations, and Tom is then able to explain why, for example, Dr. Robert Becker was able to successfully treat intractable bone fractures using pulsed DC current. In the 1960's and 1970's, in France, Antoine Prioré built and tested electromagnetic healing machines of startling effectiveness. In hundreds and hundreds of strictly controlled tests with laboratory animals, Prioré's machine cured a wide variety of the most difficult kinds of terminal, fatal diseases known today. Funded by millions of dollars, Prioré's machines concretely demonstrated a nearly 100% cure of all kinds of terminal cancers and leukemias, in thousands of rigorous laboratory tests with animals. These results were shown to medical scientists as early as 1960. A Ph.D. was even awarded by the University of Bordeaux to Eric Perisse in 1984 for a thesis on the research. Tom Bearden, using the extended electrodynamics theory discussed at the beginning of his lecture, is now able to explain in his presentation how and why the Prioré machine worked, and why there is no impediment to re-creating it today, in an even more efficient embodiment, to cure cancers and other diseases. And lest Prioré's results seem too good to be true, for the first time ever we include the report of an American member of a U.S. team who visited the Prioré laboratory—and this was not with the U.S. Office of Naval Research, who had also visited the lab. In 1987, electrical researcher/inventor Frank Golden visited Bordeaux, France with an American team desirous of further developing the technology for widespread adoption. Included in this DVD is the video trip report he recorded on his return to the U.S. Together with his analysis of how the Prioré machine worked, technical details never before discussed, and the information given to him by the Prioré team about the successful human cancer cures.